The Biennale of Sydney is confusing. A friend of mine recently described it as a "car crash mishmash" and she was right, sometimes the unexpected juxtapositions make for magical surprises, more often they leave you with a headache. The problem isn't the complexity of the pieces themselves, far from it, rather the way in which they've been bundled together with curatorial gaffer tape. 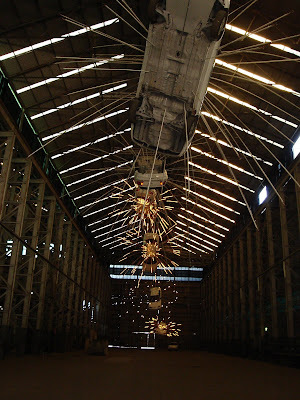 The work on Cockatoo Island ought to benefit from its setting, the giant decayed sheds, the labyrinthine corridors and the evidence of past inhabitants and industries ought be able to render work strange and beautiful, more often than not it doesn't. The inherent ghostly palimpsest of the island's history, the shapes and textures of architecture and machinery speak so eloquently themselves that much of the work feels banal and tricksy. I'm still unsure about the shouting. The Finnish 'Shouting Men's Choir', (Mieskuoru Huutajat) have produced a four channel video work where various of their members speak, then shout, their way through the text of Kevin Rudd's 'Sorry Speech' on aboriginal reconciliation to the Australian Federal Parliament. It's not profound but it is interesting. The textual meaning of the speech is lost quickly as the sound from the different channels overlaps and the tone of each speaker, or shouter, rises toward a crescendo. Rudd's speech, thoughtful and dignified, is reframed with anger, the righteous black anger of indigenous people demanding recognition of an historical wrong, the helpless anger we might in the face of their continuing appalling conditions and the venom of social and political conservatives who would still deny white culpability. The whole shouting choir thing is laced with the ludicrous but it still makes a powerful noise. Yang Fudong's six channel video installation 'East of Que Village' is brutal and moving. It shows a township in China, it's residents and a pack of feral dogs that live amongst them. The 'dog's life' cliche might come to mind too obviously but the whole works makes a conscious parallel between the packs of dogs, wiry and threatening as they fight one another over carcasses and the peasant villagers as they eke out an existence. The six screen treatment makes the piece uncomfortable and relentless. It's difficult to watch, less because of the content itself more because the poverty on display jars so badly with some of the Chinese high-art lite on display elsewhere. It reminded me of the shock one can get even today from early Rossellini films, the camera's eye calm and dispassionate and all the more powerful for that. There's some plain dull stuff too. I've seen too much of Dale Frank's high gloss canvasses with logorrhoea titles to be terribly interested in them. 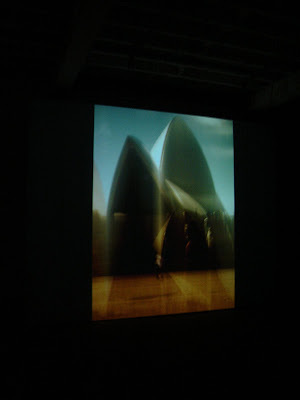 Ola Kolehmainen's 'South of Home - Journey of a Mind' is a set of projected photographs of Sydney Opera House and its surrounds. Each one has been over or multiply exposed, or shutter-speeds that are too slow have allowed camera shake or light seepage to happen. It's the sort of thing that most budding photographers have produced and considered as potentially arty and then discarded, it all just looks tedious and lazy. The centre piece, or at least the much photographed biggest piece is Cai Guo-Qiang's car wreck fantasia 'Inopportune: Stage One'. The white saloon cars might be a three-dimensional Edward Muybridge rendering of a Hollywood car crash, although the fronds of optical fibre that emanate from each car make it look more like a video game. The work is impressive in scale but seems oddly pointless. One can look at it as a meditation on sensationalism and danger, but it's hardly JG Ballard. It could otherwise be the virtual made concrete, the tumbling car with all of its intimations of explosion arrives unbroken at the end and then the sequence begins again, a hyperreal disaster. It might have been more appropriate when Top Gear was in town and despite the pyrotechnics it's unmoving. It shouldn't be a surprise that the most moving piece I saw was the most modest in scale and the most quietly understated. In 'Static No.12 (seek stillness in movement)' Daniel Crooks has created a video work of gorgeous fluidity and lingering lyricism. The piece is a widescreen video of an elderly Chinese man practicing tai chi in a park. It begins quiet normally then the video seems to slip, as if it were smudging itself on screen, the man becomes duplicated in a ribbon of slow movement. Gradually his movements dissolve, as does he and his surroundings leaving lines of pure colour, like DNA traces or atomic signatures humming across the screen. It succeeds as a purely visual poem, a chamber piece of colour and movement. More touchingly, as is so often the case with works that understand time and the decay of concrete images it makes us think of mortality, in this case of individuals and traditions. Crooks' work is so accomplished because it is also so intrinsically of it form. Hidden away in an easy to miss workshop it is a jewel worth seeking out. 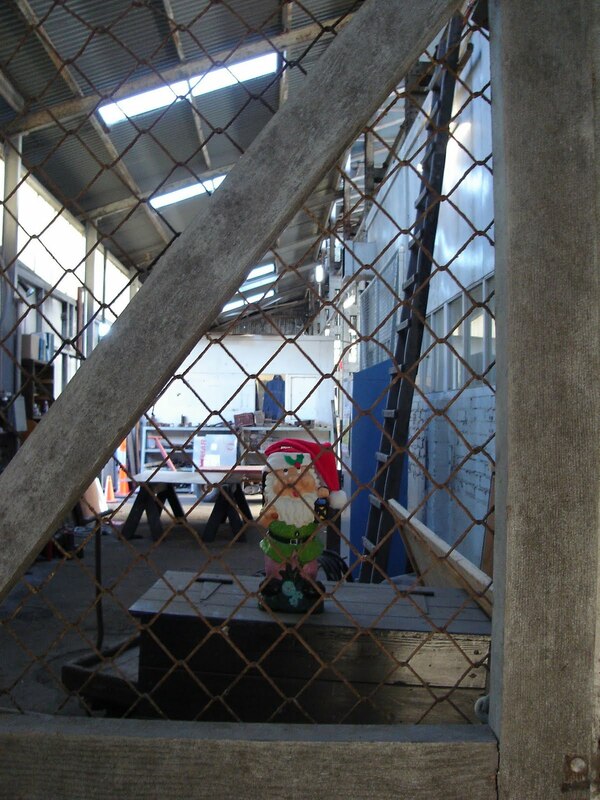 I'm due another visit to Cockatoo Island, there is a lot of work I didn't see this time. My first feeling is that nothing inhabited the place in anything like the way William Kentridge had, of course that's a high bar to set for any work but not unfair for a Biennale that makes such significant claims. I haven't seen everything on Cockatoo Island, far from it, and I hope that the next ferry jostle will be deliver something amazing, even on the basis of what I've seen so far it's worth the trip.